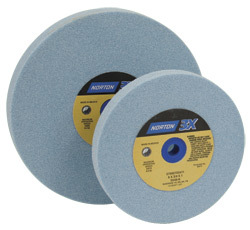 These Norton 3X grinding wheels use the same ceramic grit as the premium SG Wheels we sell below. However, they have a 30% mixture of ceramic abrasive instead of the 50% mixture of the premium SG Wheels. The 3X wheels are fast cutting, won't burn tools and have more than twice the life of a standard white aluminum oxide wheel. The 3X wheels have a K hardness and are friable. This means they are designed to fracture, exposing sharp cutting edges during grinding so they cut high speed steel more efficiently. We offer the 3X wheels in two sizes: 6" diameter by 3/4" wide or 8" diameter by 1" wide. They are available in either 46 grit for shaping tools or 80 grit for normal re-sharpening while turning. All the wheels have a 1" diameter center hole making them perfect for use with the Oneway Balancing System. The 6" wheels include bushings to fit 1/2", 5/8", 3/4" or 1" arbors. The 8" wheels include bushings to fit 5/8", 3/4" or 1" arbors.